Controversy sells. And since Donald Trump has entered the presidential race, hell, since he’s been alive, the media has earned good money on the controversy he spews. The 2016 election being the major example of this as it has been setting records in terms of ratings and ad revenue. According to media analyst Andrew Tyndall, Trump was the second most-covered story of 2015. A rich man who runs his mouth got more coverage than the refugee crisis, the barrage of terrorist attacks, the earthquake in Nepal, water found on Mars, etc, etc. 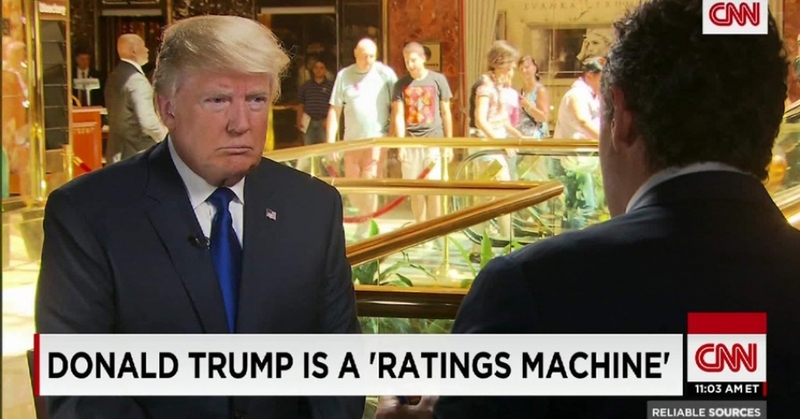 The boost he provides to ratings even has a name: the “Trump effect”. Just as adding salt and/or olive oil to any food makes it better (says Seth Godin in a totally unrelated post here), adding Donald Trump to any media piece makes the ratings go up. Tom Huddleston, Jr. of Fortune Magazine reports that CNN charged roughly 40 times its normal rate of $5,000 for a 30-second ad spot during the September GOP debate. And when he compares the ratings of the GOP vs Democratic Party debates he sees that the GOP debates averaged nearly 18 million viewers a piece, whereas the Fox News Democratic town hall drew only about 2.6 million viewers. The difference in ratings translates into a difference in revenue, and Donald Trump is a heaven-sent product that’s cranking up revenue for media outlets. If he didn’t exist, they would invent him. And as we think about it, Trump and the media have been in cahoots for decades now doing just that. What scares me is that media executives will not be content having Trump lose the election, thereby losing a large piece of the Trump product. It would be like Mickey Mouse dying and Disney not being able to sell his products anymore. The media might be so put off by the idea of Trump losing that they will actively seek to put him in a good light and Clinton in a bad light to tip the scales in his favor come November. If they succeed, whatever consequences it will have to America, they will have 4 more years of fun and profit. Now, we can discuss who was the media favorite at the time, or maybe you think it’s obvious for each election. As I look at this list, maybe Jimmy Carter was not the media favorite. The rest, if I had to guess (and I am guessing), were the media favorites. That is, they garnered the best ratings when they were presented on television or in print. Perhaps in all cases the media favorite was also the people’s favorite. Perhaps they were also the best person for the job, in which cases, the elections were a win for the people and a win for the media. In the 2016 election, the win for the media will be when Donald Trump is elected President of the United States of America. Personally, I can’t imagine that being a win for the people of America of the rest of the world. Here’s the hoping we don’t enter a bizarre, new phase of politics where it’s not the people who decides who wins, it’s the media.